Miami-Dade, Broward and Palm Beach Counties are out of the cone (projected path) but Tropical Storm Watches remain in effect. School classes cancelled for Monday in Miami-Dade, Broward Counties and the Florida Keys. Palm Beach County schools are OPEN. 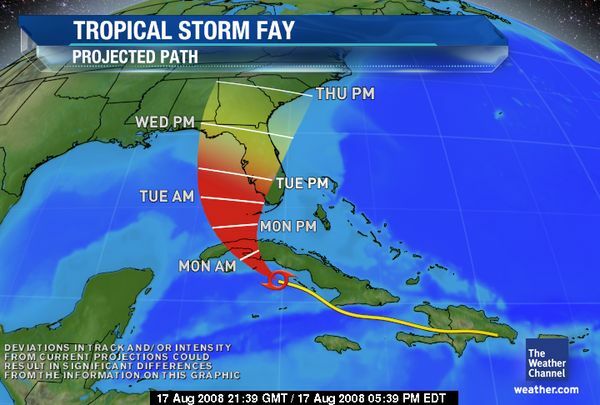 As of 11 PM EDT, Tropical Storm Fay is located at 21.4 north, 80.6 west, or about 235 miles south-southeast of Key West, Florida. Maximum-sustained winds are near 50 mph with higher gusts. Fay has slowed a bit, moving northwest at 10 mph. Fay is expected to remain a tropical storm when it makes a more direct landfall near Trinidad, Cuba, Sunday night. Rainfall totals of 4 to 8 inches are expected across Cuba and the northern Cayman islands. Isolated amounts of 15 inches are possible, causing dangerous flash flooding and mudslides. Fay will weaken as it moves across Cuba, and is forecast to emerge into the Florida Straits as a tropical storm on Monday. Sea surface temperatures in this region are very warm and warm water runs deep in the Florida Straits. This area of deep, warm water will cause Fay to ramp up to near hurricane strength before moving closer to southwest Florida Monday night into Tuesday. There is still a fairly widespread area of possible tracks according to computer models, from the southwest coast of Florida all the way to the western Panhandle of Florida. A more westward track would allow Fay to have more time in open waters, resulting in a potentially stronger storm. The further east the storm goes, the less time it will have to strengthen.